The term prey refers to an animal that is sought, captured, and eaten by a predator. A predator is an animal that hunts and kills other animals for food in an act called predation. Smaller predators, such as mice and lizards can be, and often are, prey for larger predators. The young of larger predators will also become prey. Herbivores, such as rabbits and mule deer, have only defensive adaptations and do not hunt other animals for food or to eliminate them as competition. Prey animals need to be eaten to maintain a balanced and healthy ecosystem. Without these animals being consumed, predators would starve or have to compete for plant food. Without being preyed upon, overpopulation would occur, and prey would most likely eat all available food, ultimately starving themselves to death. 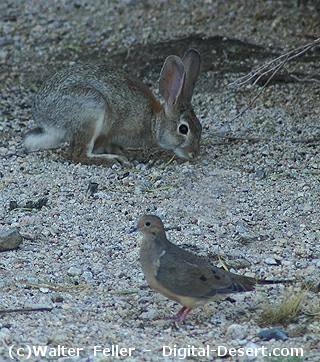 The cottontail rabbit and the mourning dove are both primary consumers and typical prey animals.